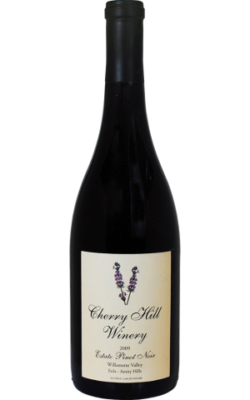 Cherry Hill Winery produced its first vintage from our new winery in 2003. The Cherry Hill Winery Estate Pinot Noir is handcrafted from our Pommard clone which makes up 55% of our 90 acre estate vineyard. Our state of the art gravity feed winery provided us with the tools to carefully handcraft this most difficult grape into a light delicate pinot noir. The fruit for this beautiful wine was hand picked from our best blocks where yields are restricted to two tons per acre. The grapes were destemmed and gravity fed to our small fermenters where each lot was carefully monitored. The wine aged in neutral French oak for one year and is a light delicate wine with beautiful color and texture. Like all things of beauty, this wine will improve with age, but it is a beauty now!